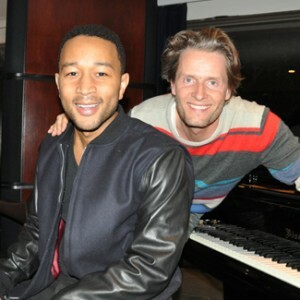 Toby Gad Co-Writes John Legend Hit "All Of Me"
Angeles where they wrote the hit “All Of Me”. During the past decade, writer/producer Toby Gad has co-written several chart-topping hits, including “If I Were A Boy” for Beyonce and “Big Girls Don’t Cry” for Fergie. He has also co-written hits or key cuts with Demi Lovato (“Skyscraper”), One Direction, Jessie J, Colbie Caillat, Kelly Clarkson, Alicia Keys, Selena Gomez, Big Time Rush and other artists. Currently, Gad is back atop the pop charts with his latest hit “All Of Me,” which he wrote with John Legend. This acclaimed, romantic ballad has become the highest-charting single of Legend’s career. Legend has dedicated “All Of Me” to his newlywed wife, model & actress Chrissy Teigen. “All Of Me” was released as a single in August 2013 (from Legend’s album Love in the Future) and has gradually risen to #2 on the Billboard Hot 100 and on the Hot R&B/Hip-Hop Songs charts. Notably, “All Of Me’ has become a hit in many other countries including the United Kingdom, Canada, Australia, Netherlands, New Zealand, Belgium and South Africa. In September 2013, Legend & Teigen got married in an intimate ceremony in Lake Como, Italy. Soon after, the couple released photos of their big day via social media on Twitter, Instagram and Tumbler. In Legend’s video of “All Of Me,” there is real footage of the wedding ceremony which is shown at the end of the video. Legend has also recorded a new version and video of “All Of Me” which features violinist, Lindsey Stirling. In addition, Gad has two songs on Sean Paul’s next album. He’s also been working with X Factor winners Alex & Sierra on Columbia Records and a number of other upcoming records.